Creamed onions was a first for me, but in trying to find something to do with this abundance of onions we have, this (or similar) recipe kept coming up. I went to the local farmers market today and creamed onions sounded perfect to go with the tomato & basil lamb sausage I brought home. I hope you enjoy it as much as we did. 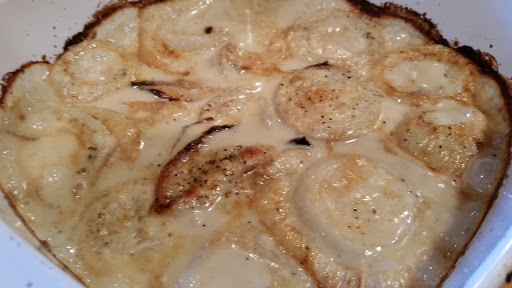 Place onion slices (not separated) on a baking sheet. Drizzle with olive oil, salt, and pepper. Roast for 20 minutes until the onions are somewhat tender. While the onions are roasting, put the milk, water, and vinegar, in a small stockpot and bring to slight boil. Remove from heat. Remove the onions from the oven and increase the heat to 450 degrees. I transferred the onions to a baking dish at this point. 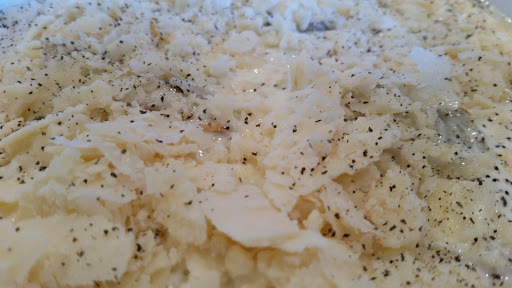 Pour the cream mixture over the onions, sprinkle with the Parmesan cheese and black pepper. Cover with aluminum foil and bake for 20 minutes. Remove the foil and bake an additional 10-15 minutes until the cheese is melted and bubbly. This would be great with steaks, meatloaf, or sausages like we had.